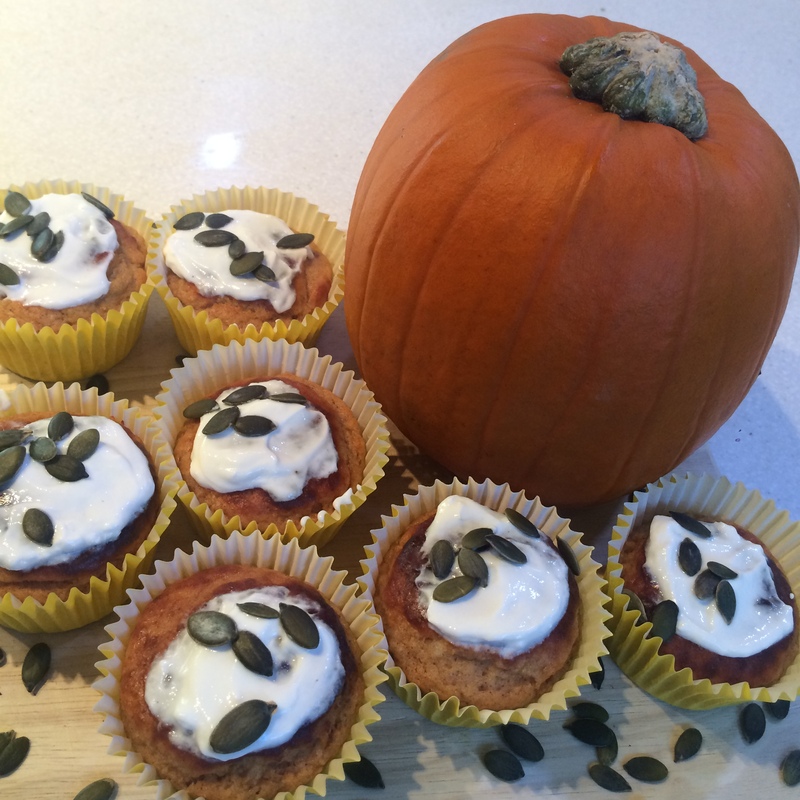 To celebrate I decided to create some yummy pumpkin protein muffins to get into the spirit of things. This recipe makes 8 large cupcakes, and is really simple to make. Firstly the pumpkin, get a small sized eating pumpkin small enough to fit in the microwave comfortably. Prick the pumpkin all over with a fork and pop in the microwave for approx 10 mins checking it until it is soft. Scoop all of the soft flesh away from the skin and blend in a blender or with a hand blender. (I use my nutribullet) It just needs to be like a puree texture nothing too fine. Add the protein powder, baking powder, cinnamon, mixed spice, and brown rice flour. Mix throughly adding in the agave, ground almonds, egg, and a heaped teaspoon of the yoghurt. The rest is to frost the cupcakes. Bake in cupcake cases in the middle of your pre-heated oven for 15/20 minutes, until they spring back when touched in the centre. Once the cupcakes have cooled top with yoghurt and sprinkle with pumpkin seeds. When I had more weight to lose, I found the weight came off a bit quicker, but once I reached a comfortable size 12, it seemed impossible for me to lose any more. Everyone has their wall that they hit, when everything that they have been doing up until now has been shedding the pounds, and then suddenly it seems to stop working. Taking those extra few seconds per meal to weigh things out, and track what I am eating has really turned that around for me, and enabled me to break through that wall. Before I really knew what I was doing, I used to happily chow down on a whole avocado, thinking to myself, look at me what a healthy snack. When in actual fact, a whole avocado is on average 230 calories, and contains over 20g of fat (albeit good fat), which on my current diet is nearly half my daily allowance. For breakfast I would wake up and pour myself a big bowl of porridge with semi skimmed milk. Now that I have learnt about portion sizes, I would say I was making myself a bowl 20g heavier than I should have been, and by bringing down the portion size, and swapping out my semi-skimmed for unsweetened almond milk, I’m saving myself 195 calories. Which I now use for a protein shake. It’s all about balancing out what you are having, and the only way to do that successfully is with a set of scales. I couldn’t understand how I was eating all of these seemingly healthy foods, and I still wasn’t losing weight. But the issue was, I was eating too much of them. There is such a thing as too many nuts and seeds, too many avocados, too much porridge, too much sweet potato. All of these things in moderation build together to create a fantastic diet, but when you don’t understand portions and you’re not tracking your foods, you just won’t see the results you are working so hard to see. Weighing and tracking your food is one of the most life changing things I have learnt to do. There is a big difference in eating healthy foods, and eating healthily. There are many ways of complicating it, but once you get to grips with portion sizes, and balancing out your fats, carbohydrates and proteins, it really is rather simple. Obviously everyone has their own goals and there isn’t really a standard formula on how much you should eat. However the free app ‘MyFitnessPal’ does allow you to put in your weight, and your goal weight, and it will create you a daily target for fats, carbs and protein. It then allows you to scan barcodes of your foods, or search for them, and input exactly what you have eaten into a diary. Believe me, when I first started this the idea of weighing and tracking everything felt like such an extra effort. But the main thing I have found is it truly does stop me just snacking on things for the sake of it. Tracking what you eat becomes second nature, and by not tracking that cheeky chocolate digestive you snuck in, you are only lying to yourself. So get yourself a set of electronic scales, download MyFitnessPal, and give tracking your food a shot! These are a fantastic way to get your chocolate fix. 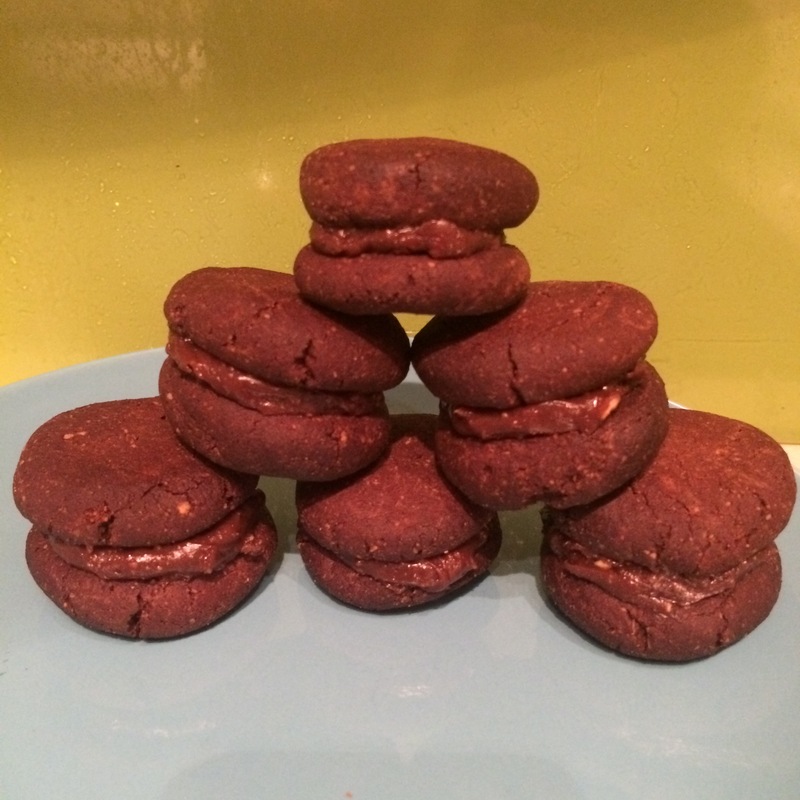 They feel super indulgent and can be whipped up so quickly when you need your chocolate high. Great with a cup of tea! Pre-heat the oven to 180 degrees/ Gas mark 4 and line a baking tray with baking parchment. It really is as simple as mixing all of your ingredients together in a bowl, and combining until it forms a crumbly dough but will hold. Get your hands in there! Separate into 12 even balls, roll out in the palm of your hand and flatten to form a small round disc. Bake in the oven for 8-10 minutes watching carefully until they become darker in colour. Leave to cool for 15/20 minutes so they harden up. While your biscuits are cooling make up your filling by simply mixing all the ingredients thoroughly. Once cooled pair up the biscuits and sandwich them together using a healthy dob of filling. Filling should set pretty quickly so leave to set and indulge. Wow! What a discovery Muscle Food was! The name alone scared me initially. When my boyfriend first mentioned I should do an order, frankly I felt like I was getting a bit above my station. Although I am training hard, and I am seeing results I do not claim to be a body builder, and just the name muscle food implied to me that it basically wasn’t for me. Oh how very wrong was I. Not only do they do fantastic deals for new customers, on going incentives and offers, but their standard prices are insane! At current prices you can go online and order 5kg of good quality, high protein chicken breasts for £25!!!! I KNOW! The chicken breasts come in two packages, and I strongly advise that you buy yourself some freezer bags and as soon as the chicken arrives pop two breasts in each freezer bag and freeze them in pairs, that way they are easier to grab a couple and defrost when you need them. Each breast weighs around 200g which is perfect for my diet, and contain a massive 44g of protein. They do a wide and wild selection of meats from Chicken breasts, to Zebra steaks and Bug burgers. They also offer next day delivery if you order by 7pm, and the box it comes in can keep your meat cool for up to 48 hours if you miss your delivery for some reason. The best discovery I have made at Muscle Food however is something called Joseph’ s high protein, reduced carb pita breads. I go for the normal sized ones, although they do come in a large. They are a tiny 50kcal per pita, and contain 4.9g protein. Not only that but they are really genuinely tasty. Bread is something I had missed the most being on a relatively low carb diet plan, and the first day I took a bite out of one of these babies I could have honestly cried. The meat is such great value, prior to this I was paying £6 for 4 chicken breasts from Sainsburys, thats £2 a breast. With Muscle Food the chicken breasts are bigger, contain more protein, and come in at around £1 a breast. Not only is it a great way of bulk buying to help with your food prep; remember fail to prepare, prepare to fail, but eating a lot of meat can get expensive and this is a fantastic way of saving money for the whole household. 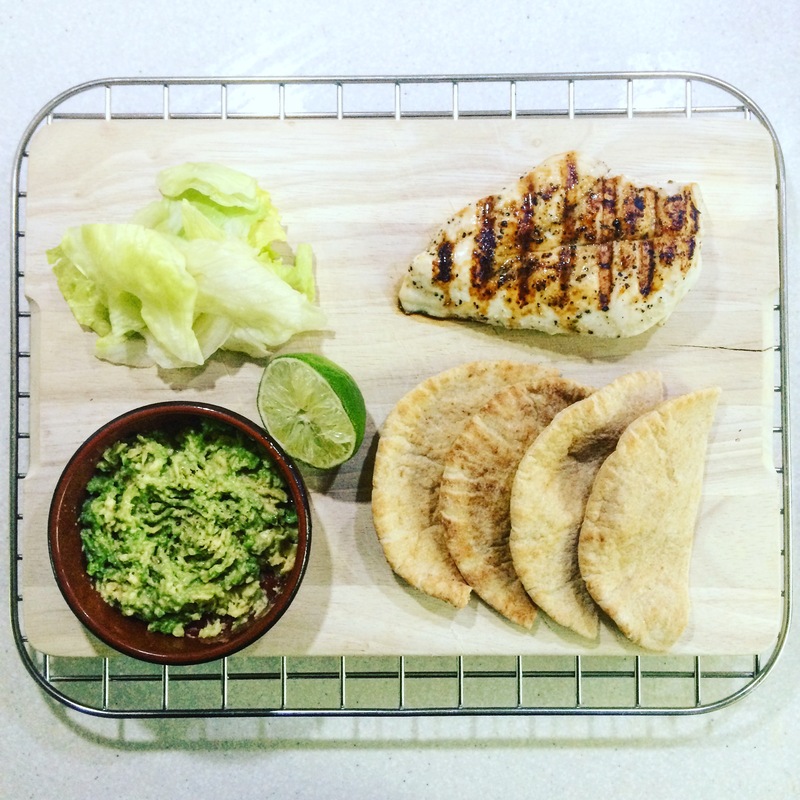 For my lunch today I had two Joseph’s pita breads stuffed with one Muscle Food 200g chicken breast, 1/2 an avocado mashed up with a squeeze of lime juice, a handful of lettuce leaves, and a pinch of salt and pepper. The whole meal came in at 415kcal/Carbs 18g/Fat 15g/Protein 56g. The moral of the story is, get yourself over to muscle food and take a look. You will not be disappointed. It’s great for anyone dieting, not just the dieters who already have big muscles…its for the ones who strive for them too. This recipe is something I have been trying to crack for WEEKS now! 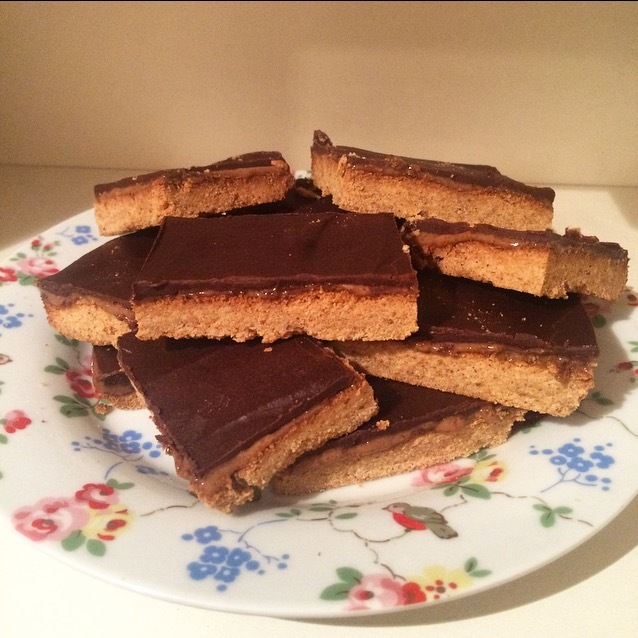 Millionaires shortbread is my boyfriends absolute favourite, and until I perfected it I would not be able to live it down! Firstly I tried creating something and the biscuit base was too spongy, then I spent time perfecting the biscuit, and now finally I have something I am utterly delighted with. This truly tastes as good as the real thing, and for less than half the calories. Please try out the recipe and let me know how you get on. I am going to try and develop it further and bring the protein level up and fat content down, but I don’t want to compromise on taste, so it’s all a work in progress. Allow 30 minutes cooling time for the shortbread base, and minimum 1 hour chilling time before cutting. Preheat the oven to 180 degrees/gas mark 4 and line an 8″x 8″ square tin with baking parchment. Bake in the oven for 8/10 minutes and remove as it starts to brown. Once cooled make up your caramel by mixing all the caramel ingredients together. adding the water last approx a tbsp at a time. Create a thick caramel texture and the spread evenly onto the biscuit. Add the protein powder and syrup to the chocolate mixture, and spread carefully on top of the caramel. Allow to chill for minimum 1 hour before slicing into 12 slices and crying tears of joy as you tuck in. I would like to start by saying I am not claiming to be some sort of Paula Radcliffe character, and in no way am I the fastest, or the best runner there is. The prospect of a marathon still scares the life out of me. However what I am, is a 25 year old who started running only this year, and can impart real practical advise on how to get started. 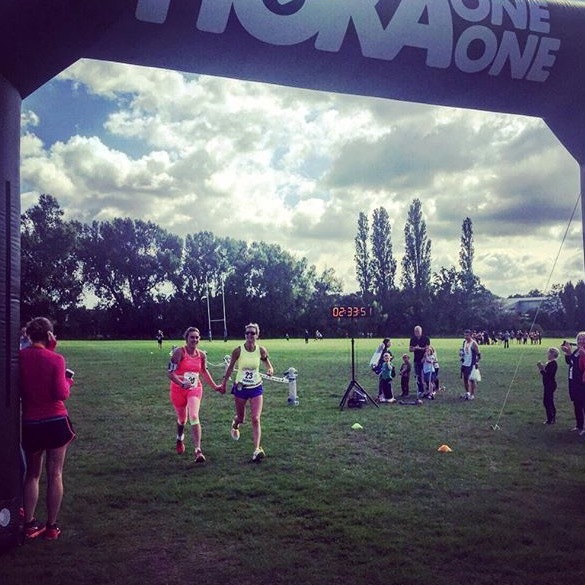 From someone who was slightly over-weight and never ran, to someone who has now completed a half marathon and a Tough Mudder challenge in the same month! A decent pair of running trainers is the most vital thing you need in order to start running. They don’t need to be expensive. Plenty of low cost sports stores do great running trainers specifically designed for the purpose. In order to avoid injury and discomfort having decent trainers is essential. Trying to get into running in a pair of converse is just not going to cut it. One thing I will say is…running hurts! Doing the long distance stuff, or the fast stuff, that HURTS. But thats not where you should be starting out. How I started running, was running for me. Competing with my own goals, beating my own times, giving myself a real focus. With so many different apps and accessories out there to track your running, from ‘map my run’ the free app, to a ‘fitbit’ worn on your wrist, it is so easy to check your progress. Some people avoid going out road running because they are scared of people looking at them and poking fun at them. On a very serious note, when was the last time you saw someone out running and actually thought ‘Ugh look at that fat idiot!’ – answer: NEVER. Road running is in my opinion far more physically demanding, and rewarding than pounding a treadmill. Not only do you have to pay to be on that treadmill, be it by buying one for home, or using one in the gym; but you don’t get to enjoy the cool air in your face, and the world around you. Going out for a run in your local area is a great way of meeting new people, exploring new parks and roads, and enjoying the area you live in. The twists and turns and bumps in the road, turn what would be a monotonous hour on a treadmill into a mini adventure, during which your thoughts are all your own. In this busy world it is very rare to get an hour to yourself without finding something else you should be doing. In the gym, your head is often swirling around thoughts of how you look in the gym, to who is walking through the door, and what work out you should be doing next. On the road in your trainers, there is nothing to think about. Just the run. So you have your trainers, and you have your road, your map my run is set up on your mobile phone. The next thing to do is to get outside, and stay outside. To start with maybe 30 minutes, 45 minutes, an hour. A good friend of mine imparted this wisdom on me, and once I realised that it wasn’t about doing a 2 mile run, a 3 mile run, a 7 mile run. It was about staying out for an hour, and seeing how far you got in that time. It doesn’t matter if in that hour you only run a mile, and in that mile you stop 10 times. Just get out there and stay out there, everyone has to start somewhere. Then the next time you run you can say to yourself, lets try that run but I am not going to stop so many times. Push yourself within your boundaries, don’t look at all these serious marathon runners and think that’s where you should be. I was very surprised at how unfit I was when I began running. Fitness is not all about your size. But I was also surprised at how quickly my fitness improved, and that constant beating of my own goals is what becomes addictive. When you take away those fears of what you look like, or not being fit enough, and you break through the boundaries of that inital pain that comes with your muscles adjusting; I am sure you will, like me get the bug. Don’t run to compete with others, just run for yourself. Don’t be afraid of what people will say when they see you out running, no one will be negative. My answer to this is so did I. When you are new to running it takes a while for your body to understand what you are putting it through. Decent trainers will prevent the majority of knee and ankle pain. Of course if you do yourself an injury make sure you rest and look after yourself, and anything you think may be more serious, get yourself to your GP. But most of those minor aches and pains in your legs start to fade the more you run, just keep going, slow and steady, build up your tolerance, your muscles, and your fitness levels. Keeping your water levels up is massively important for so many reasons, and with running you want to be hydrating throughout the day, instead of drinking lots of water during your run. Bring a normal sized bottle of water, and in the winter months I also would suggest tissues…they don’t tell you how much your nose can run when you run, and get out there and discover the thrill of running! Some days the prospect of a bowl of plain porridge in the morning just doesn’t cut it. Oats are a great way to start the day, so I decided to incorporate them into these super simple protein pancakes. They are made with banana, but those banana haters out there please do not shy away as they are only there to create the right texture, and you don’t really get a banana flavour at all, just a nice light fluffy pancake. It really is so super simple and you can whip these up in minutes…I do even before work. Personally I use a nutribullet for this recipe, whack all the ingredients in and blend. 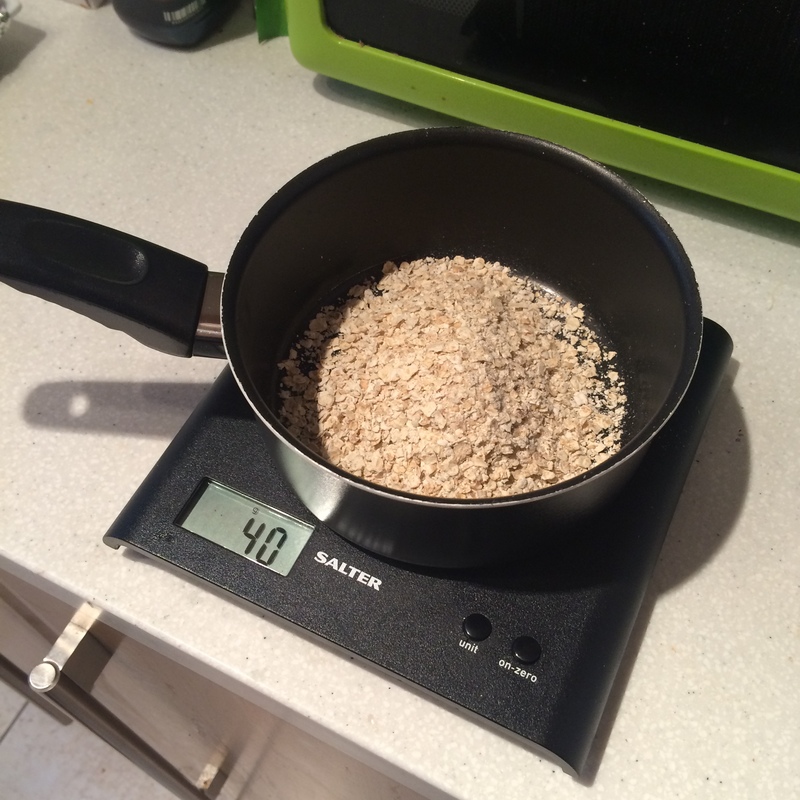 You will need to get your oats down to a fine grain so some form of blender hand held or otherwise would be needed. If you don’t have a nutribullet or similar, blend your oats down, add the protein powder, and baking powder. Mash your banana finely and add to the dry mix. Add almond milk and whisk until it forms a batter, adding a little at a time to ensure a pancake mix consistency. Pour 1/5 of the mix into your pan, when holes start to appear on the surface of the pancake its time to flip. I serve straight away with a medium banana sliced, and any other fruit I have in the house. 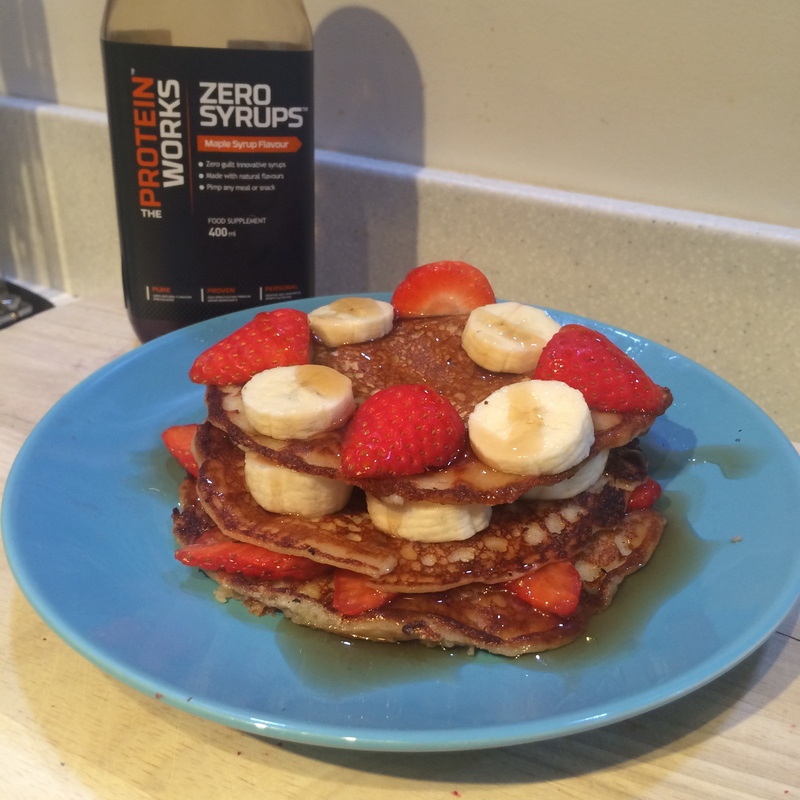 I always drizzle with ‘The Protein Works Zero Maple Syrup’ which is basically the best thing in the world. More about those later! 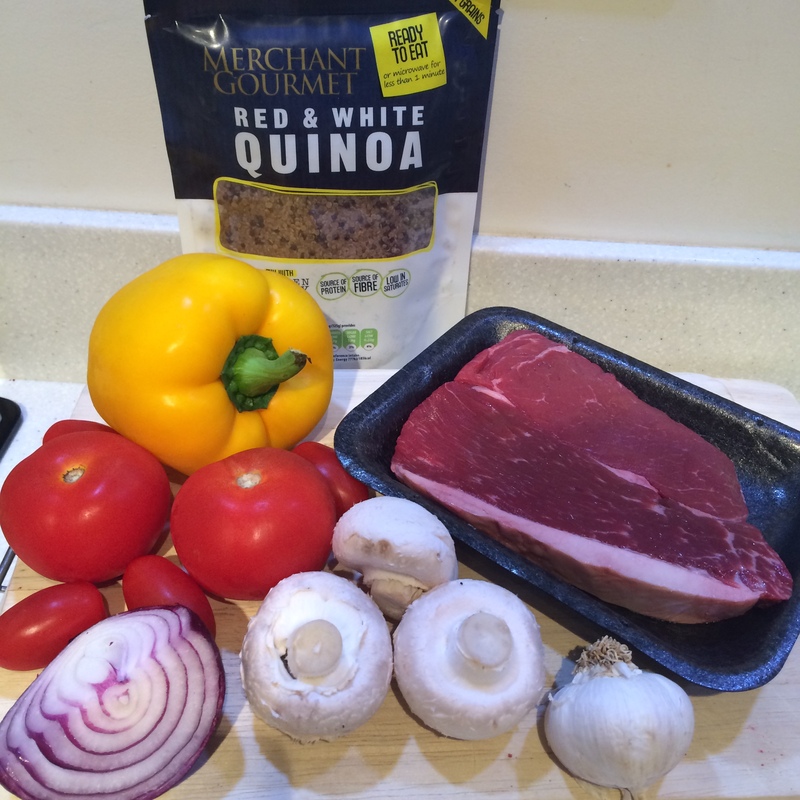 I’ll admit when I first tasted quinoa I couldn’t envisage a day when I would actually enjoy eating it…and now I kind of hate myself for saying it goes in the shopping basket every single week, without exception. How very middle class of me. So what is this quinoa (keen-wah) everyone is talking about all of a sudden. Quinoa is a fantastic wheat-free alternative to similar starchy grains such as bulgur wheat, couscous and rice. Low in saturated fat, but gives you a nice chunk of carbohydrates. It contains lots of good things; iron, B-vitamins, magnesium, phosphorus, potassium, calcium, vitamin E, and fibre. In addition to all this it is one of the most protein rich foods we can eat, and contains almost twice as much fibre as its counterparts. What to do with this amazing superfood? One mistake I used to make when cooking, pre-healthy me, was using thick creamy sauces to flavour basically everything. Pasta sauces were out of jars, and even if they were homemade I would use a tin of pre-prepared tomatoes which were full of sugar and preservatives. It really is so simple to flavour your quinoa with vegetables that will keep your diet exciting. Simply cook up your quinoa, and in a pan pop some prepared vegetables cooked in a little coconut oil, add your quinoa and hey presto! Add red onions and mushrooms to the pan and allow to soften for approx 2 minutes. Add in the chopped tomatoes and yellow pepper to the pan. Leave to soften for 5 minutes and then add finely chopped garlic and the seasoning. Add your cooked quinoa to the hot pan so that it can absorb all the moisture. Usually I add between 100-125g of quinoa to my vegetables, and serve with either a grilled chicken breast, steak with the fat removed, or white fish. Go on give quinoa a go, I defy you not to love it! This yummy cupcake recipe will really satisfy that desire for something sweet, but with only 150 calories per cupcake! Pre-heat oven to 180 degrees/gas mark 4. Soften your coconut oil in a bowl, and add the truvia/stevia, and agave nectar. 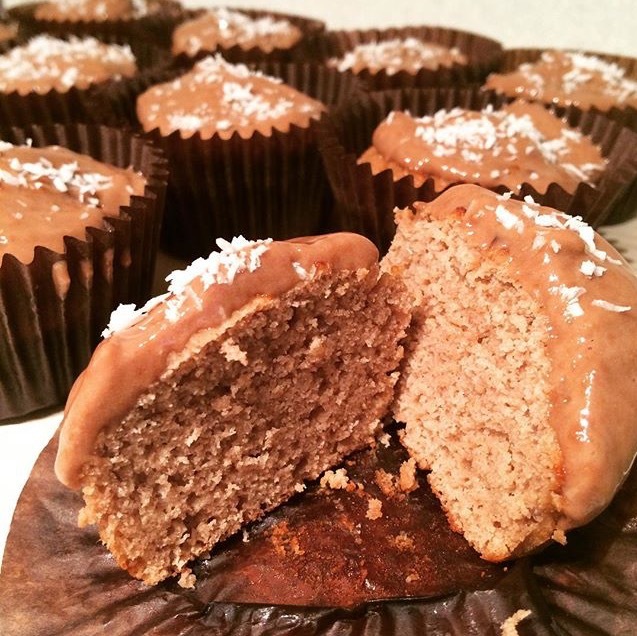 Sift in Coconut flour and chocolate whey protein and combine all the ingredients together . Create a well in the middle of the bowl and whisk in the egg . Add up to 100ml of coconut milk until the batter is thick enough to leave a trail for a few seconds when dropped from the spoon. Spoon mixture into cupcake cases, and bake in the centre of a pre-heated oven for 15/20 minutes until they are spingy to the touch. Allow to cool on a baking tray, and prepare the frosting. Add the yoghurt to the chocolate whey protein a little at a time until it reaches desired consistency. Top the cooled cupcakes with a little frosting and sprinkle with desiccated coconut if desired. Making the transition from baking delicious (calories don’t count) chocolate fudge cakes, to trying to create protein packed natural ingredient alternatives, is NOT as easy as I initially had hoped. As a baker I knew that the fundamentals would be replacing the fats, sugars and dry ingredients for healthy alternatives, and finding what those were is where my journey began. and started to list all the alternatives I could find. 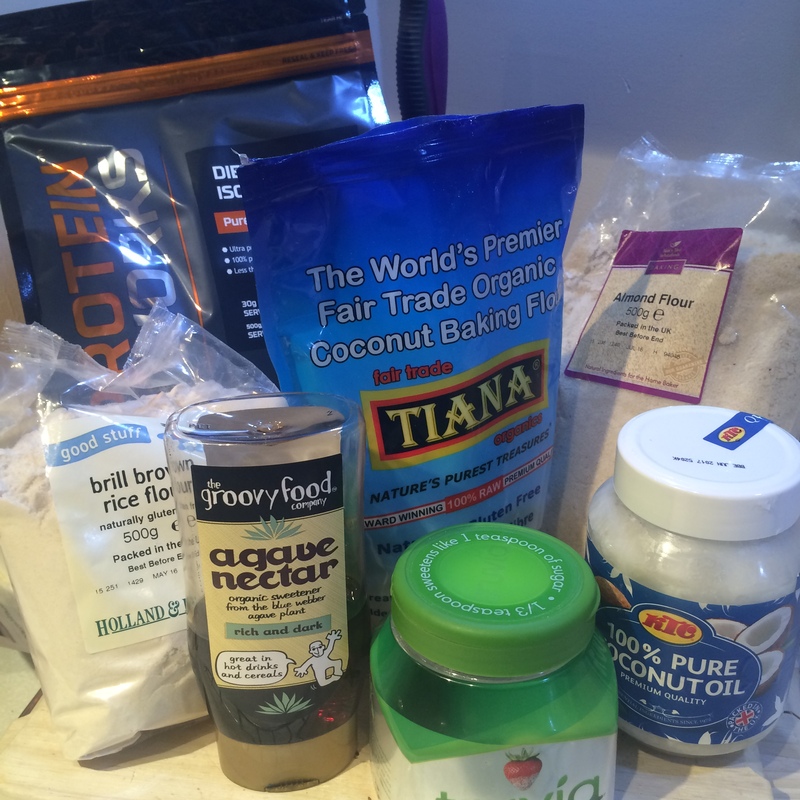 coconut flour, buckwheat flour, almond flour, brown rice flour, oat flour, quinoa flour. Coconut oil, nut butters (peanut, almond, hazelnut), greek yoghurt, applesauce, black beans, pumpkin puree, avocado. Agave Nectar, Honey, Stevia, Walden Farms syrups, The Protein Works zero syrups. Eggs are fine to use in your protein baking so no need to substitute, milk can be replaced with soya, almond, coconut or hazelnut milk, and the vanilla essence is replaced by the flavours coming from the protein powder, and other ingredients. Now it was just a matter of getting the balance of ingredients right, and flavour combinations. Let the fun begin.